A couple of years ago, I came across this article written in The Huffington Post by economist and game theorist David Levine. It carried the provocative title "Why Economists Are Right," and argued back against all those who were then criticizing economics -- especially the rational expectations assumption -- in the aftermath of the financial crisis. Levine's article is delicately crafted and sounds superficially convincing. Indeed, it seems to make the rational expectations idea almost obvious. His argument is a masterpiece of showmanship in the manner of Milton Friedman -- its conclusion seems unavoidable, yet the logic seems somehow fishy, though in a way that is hard to pin down. In simple language what rational expectations means is "if people believe this forecast it will be true." By contrast if a theory is not one of rational expectations it means "if people believe this forecast it will not be true." Obviously such a theory has limited usefulness. Or put differently: if there is a correct theory, eventually most people will believe it, so it must necessarily be rational expectations. Any other theory has the property that people must forever disbelieve the theory regardless of overwhelming evidence -- for as soon as the theory is believed it is wrong. Seems convincing, doesn't it? Or at least almost convincing. Is this the only claim made by the rational expectations assumption? If so, maybe it is reasonable. But there's a lot lurking in this paragraph. When I first read this I thought -- well, he's just assuming that people will learn over time to hold rational beliefs. In other words, he simply asserts (maybe because he believes this) that the only possible outcome in our world has to be an equilibrium. If people have certain beliefs, and their actions based on these lead to a collective outcome that does not confirm those beliefs, then they'll have to adjust those beliefs. There's no equilibrium but ongoing change. From this, Levine assumes that if this goes on for a while that peoples' beliefs will adjust until they lead to actions and collective outcomes that confirm these beliefs and bring about an equilibrium. But this is simply his personal assumption, presumably because he likes game theory and has expertise in game theory and so likes to think about equilibria. The world is much more flexible. The more general possibility is that people adjust their beliefs, act differently, and their collective behaviour leads to another outcome that against does not confirm their beliefs (at least not perfectly), so they adjust again. And there's an ongoing dance and co-evolution between beliefs and outcomes that never settles into any equilibrium. One of the earliest insights of economics—it certainly goes back to Smith—is that aggregate patterns [in the economy] form from individual behavior, and individual behavior in turn responds to these aggregate patterns: there is a recursive loop. It is this recursive loop that connects with complexity. Complexity is not a theory but a movement in the sciences that studies how the interacting elements in a system create overall patterns, and how these overall patterns in turn cause the interacting elements to change or adapt. It might study how individual cars together act to form patterns in traffic, and how these patterns in turn cause the cars to alter their position. Complexity is about formation—the formation of structures—and how this formation affects the objects causing it. This equilibrium shortcut was a natural way to examine patterns in the economy and render them open to mathematical analysis. It was an understandable—even proper—way to push economics forward. And it achieved a great deal. ... But there has been a price for this equilibrium finesse. Economists have objected to it—to the neoclassical construction it has brought about—on the grounds that it posits an idealized, rationalized world that distorts reality, one whose underlying assumptions are often chosen for analytical convenience. I share these objections. Like many economists I admire the beauty of the neoclassical economy; but for me the construct is too pure, too brittle—too bled of reality. It lives in a Platonic world of order, stasis, knowableness, and perfection. Absent from it is the ambiguous, the messy, the real. Here I think Arthur has perfectly described the limitation of Levine's position. Levine is happy with rational expectations because he is willing to restrict his field of interest only to those very few special cases in which peoples' expectations do correspond to collective outcomes. Anything else he thinks is uninteresting. I'm not even sure that Levine realizes he has so restricted his field of interest only to equilibrium, thereby neglecting the much larger and richer field of phenomena outside of it. If we assume equilibrium we place a very strong filter on what we can see in the economy. Under equilibrium by definition there is no scope for improvement or further adjustment, no scope for exploration, no scope for creation, no scope for transitory phenomena, so anything in the economy that takes adjustment—adaptation, innovation, structural change, history itself—must be bypassed or dropped from theory. The result may be a beautiful structure, but it is one that lacks authenticity, aliveness, and creation. The European transactions tax -- an act of pure hope? My latest column in Bloomberg came out about a week ago. Forgot to mention it. The story is this: The European Commission has very firm plans to introduce a financial transactions tax -- a "Tobin" style tax -- on most financial transactions at the beginning of January 2014. That's just over 6 months away. I was surprised to learn they were taking this step, as I thought that very little was really known about the likely consequence of such a tax, especially introduced on such a grand scale. So, I spent a week or so looking into all the research I could find on financial transactions taxes, theoretical and empirical, and came to the conclusion that -- indeed, very little is known. But Europe is going ahead anyway! We conclude that, contrary to what is often assumed, a Tobin Tax is feasible and, if appropriately designed, could make a significant contribution to revenue without causing major distortions. However, it would be unlikely to reduce market volatility and could even increase it. But if you read the report, you'll see that the outcome seems very likely to depend on fine details of how the tax is implemented and of the markets to which it is applied. Other important studies are this one by Westerhoff and Pellizzari which uses an agent based market model to test how the consequences of a transactions tax might depend on market microstructure. I think this is among the most sophisticated studies done to date (although it can still be improved in many ways and represents a beginning, not an end). There's also an older review from 1993 by Schwert and Seguin that I read and which is useful (sadly, I'm not sure where the link is.... I have a pdf and found it by googling, that's all I can say). Finally, if you have the brave heart to read the original impact assessment of the EC proposal for the tax, it is here. That report doesn't actually mention any research on how the tax will likely influence markets, but only looks at how the macroeconomy might be effected. I have been very concerned about Europe. The euro is in the process of destroying the European Union. To some extent, this has already happened, in the sense that the EU was meant to be a voluntary association of equal states. The crisis has turned it into something that is radically different: a relationship between creditors and debtors. And, in a financial crisis, the creditors are in charge. It is no longer a relationship between equals. The fate of Italy, for example, is no longer determined by Italian politics – which is in a crisis of its own, I would say – but rather by the creditor/debtor relationship. That is really what dictates policies. The point is that this European crisis is NOT JUST a financial crisis. It is much more serious than that. It's a political and social crisis. We talk about it in financial terms, but the really important thing is a massive breakdown in cooperation and political function, obviously in Europe, but elsewhere as well. A few years ago, the idea of a global financial crisis seemed pretty hard to imagine. What are we failing to imagine now? The evidence is growing that austerity is not working. Sooner or later, I expect a reversal of the current fiscal policy – the sooner, the better. There is a political problem, namely that the creditors dictate economic policy. And there is a financial or an economic problem, namely that the policy the creditors advocate is counter-productive. The rest of the world, in the face of excessive unemployment, is no longer trying to reduce prematurely government debt accumulated during the financial crisis. And the rest of the world engages in quantitative easing. The latest convert is Japan, where the central bank has been forced to abandon its orthodox monetary policy. So I think it is only a matter of time. Something has to give in Europe, because Europe is out of touch, out of synch, with the rest of the world. For anyone who is interested, I will be in Oxford in two weeks speaking along with Doyne Farmer at the above public event. Should be interesting. Organized by the Institute of Physics. Research in so-called "econophysics" -- the application of ideas and concepts from physics to problems in finance and economics -- tends to be quite controversial. Many economists in particular seem to find it fairly annoying, although quite a few others either work in the area or do work that is closely associated in conceptual terms. Physicists in the area have been criticized on various occasions for being ignorant of prior work in economics (sometimes true), of using less than rigorous statistics (I haven't seen anything convincing on this) and of employing unrealistic models. 1. More than anything, physicists have helped to establish empirical facts about financial markets; for example, that the probability of large market returns decreases in accordance with an inverse cubic power law in many diverse markets. This seems to be a universal result, at least approximately. I've written about this work here. Work by physicists has also established other generic market patterns such as the self-similar structure of market volatility. I very nice review of these patterns is this one by Lisa Borland and colleagues. Now, did econophysicists initiate this kind of work? Of course not. Benoit Mandelbrot found the first evidence for fat tailed distributions in the early 1960s (and Eugene Fama even wrote about that work in his first paper!). But research by physicists has made our knowledge of these empirical regularities much more precise. 2. 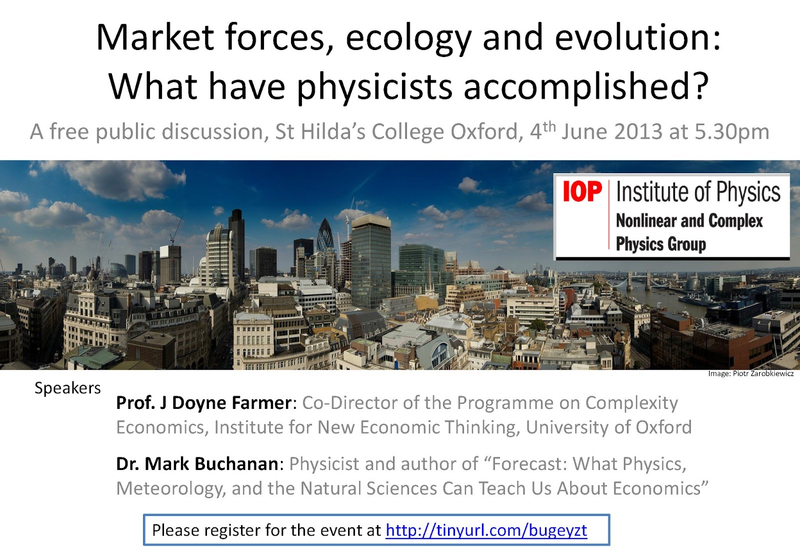 Physicists have also identified instructive links between markets and other natural phenomena. For example, in the period following a large market crash, markets show lingering activity which follows the famous Omori law for earthquake aftershocks (events become less likely in simple inverse proportion to the time after the main shock). Such connections indicate that the explanation of such market dynamics may well not depend on facts specific to finance and economics; that more general dynamical principles may be involved. 3. 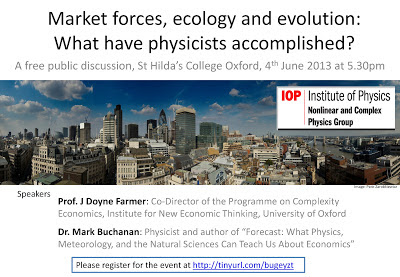 Physicists have also helped develop more realistic models of markets, here mostly in collaboration with economists. In the mid-1990s, researchers at the Santa Fe Institute first demonstrated how fat-tailed dynamics could arise naturally in models representing a market as an ecology of interacting adaptive agents. Models of this kind have since become widespread and used to perform some of the most sophisticated tests of policy proposals -- for the idea of a financial transactions tax, for example, as currently planned by the European Commission. For this, econophysics deserves some credit. For a nice review, see this paper by economist Blake Lebaron (I've summarized it here). Hommes makes it sound here as if this transformation and paradigm shift is now widely accepted in economics. I'm not so sure about that as there still seem to be plenty of people eagerly working away on rational representative agent models. 4. Work in econophysics -- through the study of minimal models such as the minority game -- has also revealed surprising qualitative features of markets; for example, that a key determinant of market dynamics is the diversity of participants' strategic behaviour. Markets work fairly smoothly if participants act using many diverse strategies, but break down if many traders chase few opportunities and use similar strategies to do so. Strategic crowding of this kind can cause an abrupt phase transition from smooth behaviour into a regime prone to sharp, virtually discontinuous price movements. If this point seems esoteric, one fairly recent study found more than 18,000 instances over five years where a stock price rose or fell by roughly 1% or more in well under a tenth of a second. These "glitches" or "fractures" may signal a transition of markets into a regime dominated by fast algorithmic trading. As algorithms compete on speed, they naturally rely on simple strategies, which encourages strategic crowding. The underlying phase transition phenomenon may therefore be quite relevant to policy. I know of nothing in traditional economic analysis that describes this kind of phase transition or does anything to elucidate the kinds of conditions under which it might take place. 5. Yale economist John Geanakoplos has argued for two decades that a key variable driving major economic booms and busts is the amount of leverage used by financial institutions. It goes up in good times, down in bad. Since the financial crisis, controlling leverage has become a major new focus of financial regulators, and their work may well benefit from physics-inspired models of the dynamics of markets in which firms compete with one another through the use of leverage. A notable study by Geanakoplos and two physicists found that such a market will naturally become unstable as leverage increases beyond a threshold. This boundary of instability is not at all obvious to market participants or made evident by standard economic theories. Such models may well help improve macroeconomic policy and financial regulation (I've written a little more on this here). 6. Physicists have also helped clarify other fundamental sources of market instability. For example, standard thinking in economics holds that the sharing of risks between financial institutions -- through derivatives and other instruments -- should both make individual firms safer and the entire banking system more stable. However, a collaboration of economists and physicists recently showed that too much risk sharing in a network of institutions can decrease stability. (Some discussion of this work here.) An over-connected network makes it too easy for trouble originating in one place to spread elsewhere. Again, this work involves an important collaboration between economists and physicists. 7. On a similar theme, fundamental analysis by econophysicists has examined the relationship between market efficiency and stability. In economic theory, markets become more efficient -- more able to pool collective wisdom and price assets accurately -- as they become more "complete," i.e. equipped with such a broad range of financial instruments that essentially any trade can be undertaken. The econophysics work has shown, however, that completeness brings with it inherent market instability, a possibility never raised (to my knowledge) by standard economic analyses. 8. The complexity of today’s markets makes is essentially impossible for financial institutions to judge the risks they face, as the health of any decent-sized financial institution depends on a vast web of links to other institutions about which little may be known. To improve risk judgement, econophysicists have recently developed a network measure called DebtRank which aims to cut through network complexity and reveal the true riskyness of any particular institution. This idea may also provide a natural means for making markets more stable, for if regulators made DebtRank results public, then anyone would, at a glance, gain a much more accurate view of the true risks associated with any bank. If banks seeking to borrow funds were forced to do so from the least risky banks, systemic instability would be improved. This is, for now, a highly speculative idea, but one that clearly has promise. So there -- a list of 8 specific areas where I think econophysics has had an important impact on economics and finance. This is, as I said, a very short list, and of course reflects only my limited view. It also reflects limitations on how much I can write in one sitting, as there are clearly other notable achievements such as recent theories of market impact -- here and here, for example -- which make significant steps toward explaining how much prices change when someone sells an asset. I haven't mentioned applications of random matrix theory which cast serious doubt over how much empirical calculations of stock correlations really imply about the true correlations between those assets (undermining Markowitz portfolio theory). Then there's an entire field of work exploring how firm growth rates scale with firm size and what might account for this. All of which suggests, to my mind, that econophysics has been a very valuable development indeed. It seems that famed hedge fund manager Philip Falcone has, in principle, agreed to terms with the SEC in the case in which he was accused of "manipulating the market, using hedge fund assets to pay his taxes and “secretly” favoring select customers at the expense of others." Not surprisingly, as this is the SEC we're talking about, the agreement included the usual weasel clause letting the defendant admit no guilt. But it gets even better. The settlement deal... is also notable for something that it did not include: a common provision that prohibits defendants from committing future violations with fraudulent intent. The lack of a so-called fraud injunction is an unusual victory for the target of an S.E.C. action. You may wonder why it even makes sense to include a clause prohibiting a defendant from committing future fraudulent acts, as fraud is already illegal. And just being a citizen essentially means you've agreed to it. Apparently, this clause makes it easier to prosecute future cases (the court can hold the defendant in contempt of court, at least in principle, for violating the law even after telling the court that he wouldn't). But here we have the SEC going to extra lengths not to make Mr. Falcone make such a terrible promise. ...where I tend to part company with many of my colleagues is with the policy conclusions I reach. Many of my colleagues think of me as excessively dirigiste, or perhaps anti-market. A colleague at Harvard’s Economics Department would greet me by saying “how is the revolution going?” every time he saw me. A peculiar deformation of mainstream economics is the tendency to pooh-pooh the real-world relevance of all the theoretical reasons market fail and government intervention is desirable. This sometimes reaches comical proportions. You get trade theorists who have built their entire careers on “anomalous” results who are at the same time the greatest defenders of free trade. You get growth and development economists whose stock in trade are models with externalities of all kinds who are stern advocates of the Washington Consensus. When you question these policy conclusions, you typically get a lot of hand-waving. Well, the government is corrupt and in the pockets of rent-seekers. It does not have enough information to undertake the right kinds of interventions anyhow. Somehow, the minds of these analytically sophisticated thinkers turn into mush when they are forced to take seriously the policy implications of their own models. There are powerful forces having to do with the sociology of the profession and the socialization process that tend to push economists to think alike. Most economists start graduate school not having spent much time thinking about social problems or having studied much else besides math and economics. The incentive and hierarchy systems tend to reward those with the technical skills rather than interesting questions or research agendas. An in-group versus out-group mentality develops rather early on that pits economists against other social scientists. All economists tend to imbue a set of values that tends to glorify the market and demonize public action. So the hurdles for the economists that want to depart from the conventional path are pretty high. Above all, they must play by the methodological rules of the profession. That means using the language of mathematics, the standard optimizing, general-equilibrium frameworks, and the established econometric tools. They must pay their dues and demonstrate they remain card-carrying members in good standing. In my own case, every piece of conventional wisdom I challenged had already become a caricature of what sounds economics teaches us. I wasn’t doing anything more than reminding my colleagues about standard economic theory and empirics. It was like pushing on an open door. I wasn’t challenging the economics, but the sociology of the profession. For example, when I first began to criticize the Washington Consensus, I thought I was doing the obvious. The simple rules-of-thumb around which the Consensus revolved had no counterpart in serious welfare economics. Neither were they empirically well supported, in view of East Asia’s experience with heterodox economic models. When you questioned supporters closely, you first got some very partial economic arguments as response, and then as a last resort some political hand-waving (e.g., “we need to get the government to stop doing such things, otherwise rent-seeking will be rife…”). My argument was that we should take economics (and political economy) more seriously than simply as rules of thumb. Economics teaches us to think in conditional terms: different remedies are required by different constraints. That way of thinking naturally leads us to a contextual type of policy-making, a diagnostic approach rather than a blueprint, kitchen-sink approach. Similarly, when I questioned some of the excessive claims on the benefits of globalization I was simply reminding the profession what economics teaches. Take for example the relationship between the gains from trade and the distributive implications of trade. To this day, there is a tendency in the profession to overstate the first while minimizing the second. This makes globalization look a lot better: it’s all net gains and very little distributional costs. Yet look at the basic models of trade theory and comparative advantage we teach in the classroom and you can see that the net gains and the magnitudes of redistribution are directly linked in most of these models. The larger the net gains, the larger the redistribution. After all, the gains in productive efficiency derive from structural change, which is a process that inherently creates gainers (expanding sectors and the factors employed therein) and losers (contracting sectors and the factors employed therein). It is nonsensical to argue that the gains are large while the amount of redistribution is small – at least in the context of the standard models. Moreover, as trade becomes freer, the ratio of redistribution to net gains rises. Ultimately, trying to reap the last few dollars of efficiency gain comes at the “cost” of significant redistribution of income. Again, standard economics. Saying all this doesn’t necessarily make you very popular right away. I remember well the reception I got when I presented my paper (with Francisco Rodriguez) on the empirics of trade policy and growth. The literature had filled up with extravagant claims about the effect of trade liberalization on economic growth. What we showed in our paper is that the research to date could not support those claims. Neither the theoretical nor empirical literature indicated there is a robust, predictable, and quantitatively large effect of trade liberalization on growth. We were simply stating what any well-trained economist should have known. Nevertheless, the paper was highly controversial. One of my Harvard colleagues asked me in the Q&A session: “why are you doing this?” It was a stunning question. It was as if knowledge of a certain kind was dangerous. Years earlier, when I wrote my monograph Has Globalization Gone Too Far? I had been surprised at some of the reaction along similar lines. I expected of course that many policy advocates would be hostile. But my arguments were, or so I thought, based solidly on economic theory and reasoning. A distinguished economist wrote back saying “you are giving ammunition to the barbarians.” In other words, I had to exercise self-censorship lest my arguments were used by protectionists! The immediate qestion I had was why this economist thought barbarians were only on one side of the debate. Was he unaware of how, for example, multinational firms hijacked pro-free trade arguments to lobby for agreements – such as intellectual property – that had nothing to do with free trade? Why was it that the “barbarians” on one side of the issue were inherently more dangerous than the “barbarians” on the other side? But ultimately, the reward of challenging conventional wisdom that has gone too far is that you are eventually proved right. The Washington Consensus is essentially dead, replaced by a much more humble approach that recognizes the importance of locally binding constraints. And many of the arguments I made about the contingent nature of the benefits from trade and financial globalization are much closer to the intellectual mainstream today than they were at the time. This is a very short interview with Dave Cliff of the University of Bristol who knows more about high frequency trading, the good and the bad, than just about anyone else. Short take: the wild west period may be over, the potential for huge profits has been arbitraged away, HFT now looks more like part of the fixed and settled landscape than something really new. In case anyone is in London this Friday night, 3 May 2013, I'll be taking part in a public panel discussion and question and answer session along with Nate Silver, author of the bestseller The Signal and the Noise. Other panellists will be Robert Fildes, director of the Forecasting Centre, Lancaster Business School, Gregory Mead, CEO and co-founder of Musicmetric and Jessica Bland (Chairperson), in charge of Technology Futures at the London-based and forward-thinking charity Nesta. The event will run from 18:00 to 20:00 at Shoreditch Town Hall, 380 Old Street, EC1V London. Topic: how to think about the future in which technology and data is rapidly amplifying the possibilities of making predictions. Yes, I'm am talking about THE famous Shoreditch Town Hall, which was of course the first building in the UK to be fitted with electricity (at least Jessica Bland said so).